Chargebee is a smart and comprehensive recurring billing solution which covers all the nuts & bolts of managing subscriptions and is built for global SaaS businesses. Chargebee gives you the ability to work across 12 payment gateways including - including Braintree and Stripe, along with offline payments (via ACH and wire transfer) with all accounts receivables in one place. Comprehensive Invoicing, Credit Notes and Global Taxation including EU VAT, smart proration logic, role based access for teams. Chargebee offers SaaS Metrics dashboard along with customised reporting on a need basis. You can benefit from our consultative customer support with 24*7 application support. Cloud Accounting and on the Go! Accountants and business owners can now access your updated accounting data and stay connected from anywhere, on any device, with any number of authorised users. Keep track of the cash flow through sales and purchases. You can now spend less time and manual effort on finding the right transactions. 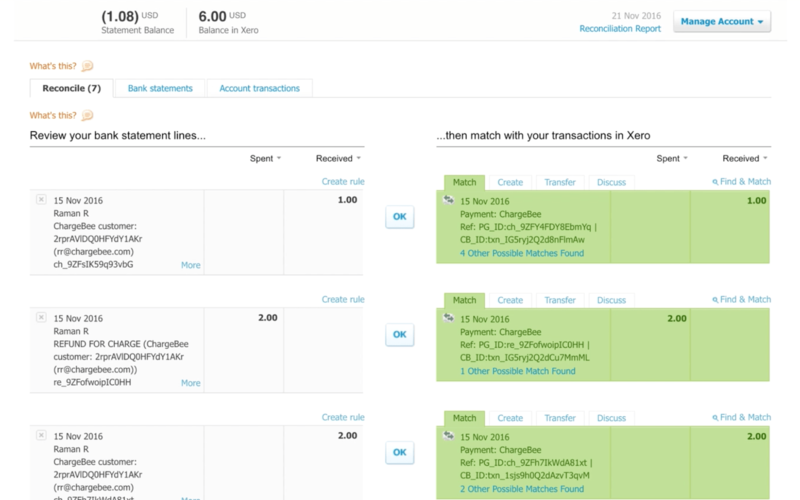 Connect Xero to your bank account to ensure that transaction statements are imported for easy reconciliation. 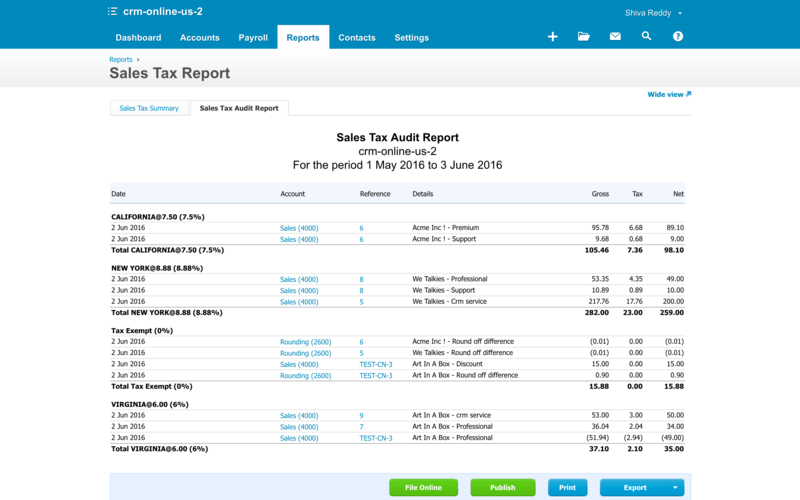 Stay up-to-date with the financials in your business using Xero’s dashboard. Generate P&L Statements, Balance Sheets, and Tax Reports; track your business performance using Xero’s interactive financial reporting and budget in real time. Xero easily integrates with 500 business applications like inventory, invoicing, time tracking, payment gateways, billing, taxation, payroll, timesheets, and expense management. Xero is a third-party service provider and is governed by separate terms, privacy, and support documentation on their website. 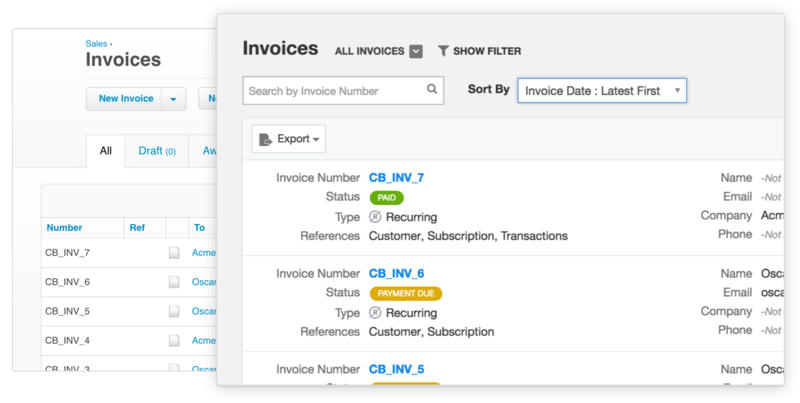 Save the time spent on manual updates, CSV imports, and running data scripts as the integration offers automatic sync of invoices and related data. This integration will accurately sync invoices, payments, credit notes, refunds, customers, items, and taxes to Xero with great precision. Phew! That’s a big list! All your data will flow into the right chart of account you wish to sync with. This can be a single account for all items or different revenue accounts for each item. Separate chart of accounts can be configured for rounding off difference and writing off bad debts. Get access to comprehensive and accurate reporting in Xero with a detailed summary of Accounts Receivables, Sales Transactions, and Sales Tax data fed from Chargebee. You can file taxes (for NZ, Australia, UK EU-VAT) from within Xero itself as data has been synchronized efficiently for you. Do you spend hours manually reconciling payments between Stripe and Xero? Tired of seeing the mismatched numbers between your accounting system and bank statement? The Payment Reconciliation feature between Stripe and Xero, simplifies your bookkeeping and allows reconciliation of amounts in the bank against the transactions in the book of accounts. Also available as a Google Chrome extension, so you can reconcile with the click of a button! Visit Xero to learn more about setting up this integration. Xero is provided by a third-party and is governed by separate terms, privacy, and support documentation. I already have an account in Xero, how do I connect? On what plan is the Xero and Chargebee integration available? What will be synced to Xero? How do I test my integration works with Xero without signing up for a paying account? I have already synced some invoices manually to Xero. What should I do now? Some changes I made in Xero are not syncing back to Chargebee - is this going to be a problem? You can either connect to an existing account in Xero or create a new account. Chargebee will support both. The Chargebee - Xero integration is available from Chargebee's Rise Plan and above. Invoices, payments, refunds, credit notes, customers, items, taxes linked to the invoices will be notified to Xero. If customers do not have invoices, or items are not linked to invoices, then these customers or items will not be updated to Xero. We recommend you use a demo company to test how Xero works. Additionally, you can create a test organisation and sync your Chargebee data and verify. If it works fine, then you can begin syncing your live data to Xero. You can begin invoice sync from a specific date and invoices created from that date will only be updated to Xero. Chargebee will not pull updates from Xero, this is a ONE WAY SYNC from Chargebee -> Xero. Any updates should be made in Chargebee and it will be synced to Xero. Two way sync between both the systems is not supported.